They've finished. It's in the can, as they say! Or on the harddrives this time. "We made it! 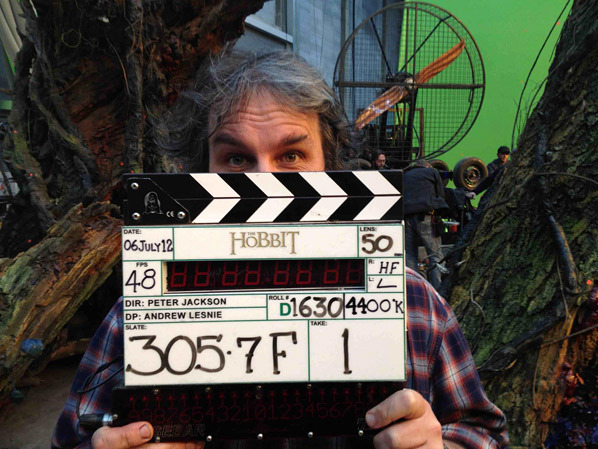 Shoot day 266 and the end of principal photography on The Hobbit. Thanks to our fantastic cast and crew for getting us this far, and to all of you for your support! Next stop, the cutting room. Oh, and Comic Con! Cheers, Peter J" That was the note left by Mr. Jackson on his Facebook page along with the wrap photo below. Given I'm a huge LOTR fan and can't wait for The Hobbit, I thought it was worth marking this day in cinematic history. While we still have to wait a few years for the finished products, it's a memorable day for the production. In a hole in the ground there lived a hobbit… The Hobbit, being directed by Peter Jackson in two separate parts, is set in Middle-earth 60 years before Tolkien's Lord of the Rings, which Jackson and his filmmaking team brought to the big screen in a trilogy ten years ago. The Hobbit films, with screenplays by Fran Walsh, Philippa Boyens, Guillermo del Toro and Peter Jackson, will be shot consecutively in digital 3D using the latest camera technology. The Hobbit follows the journey of Bilbo Baggins, played by Martin Freeman, who is swept into an epic quest to reclaim the lost Dwarf Kingdom of Erebor, which was long ago conquered by the dragon Smaug. The Hobbit: An Unexpected Journey arrives in theaters in 3D/48FPS December 14th. So this means Mr. Jackson is onto editing, then if he deems it necessary reshoots? Probably reshoots for the inevitable extended editions. "While we still have to wait a few years for the finished products, it's a memorable day for the production." ?????? The first movie comes out at the end of the year, and the second movie late in 2013. So what exactly do we have to wait a few years for???? So... teaser soon then? TDKR attached teaser would be... epic.